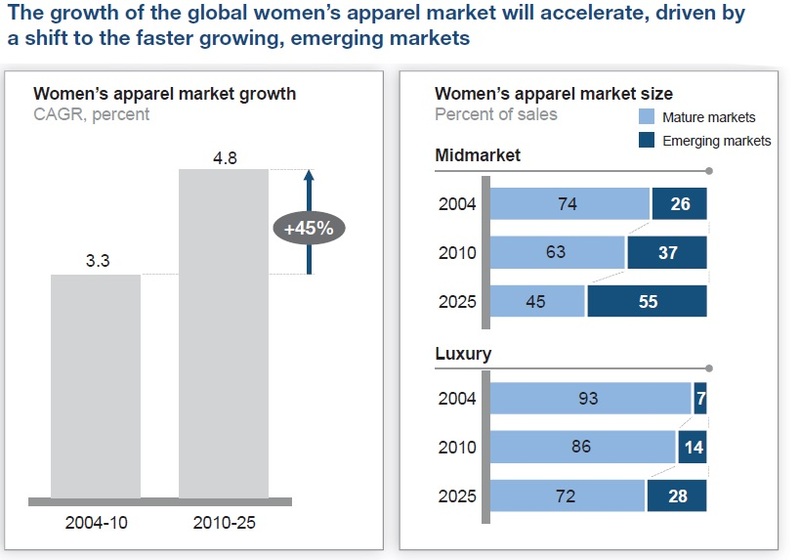 According to a recent study conducted by McKinsey, the global women’s apparel market growth rate is forecasted to increase by 50 percent over the next 12 years, largely driven by the increasing weight of emerging markets such as China and Russia. Historically, the global women’s apparel market has grown at just over 3 percent per year; However, by 2025 the growth rate is expected to approach 5 percent per year. By 2025, women’s apparel is expected to account for 55% of global apparel sales and 60% of sales growth. 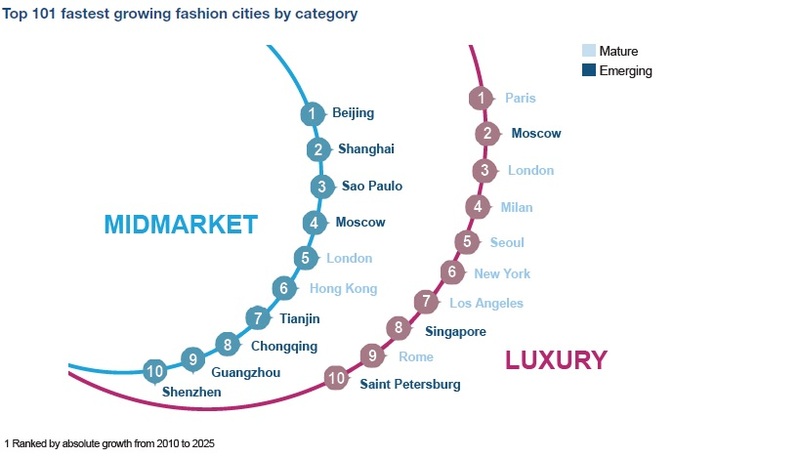 For fashion players, cities are mattering more than any other product category. 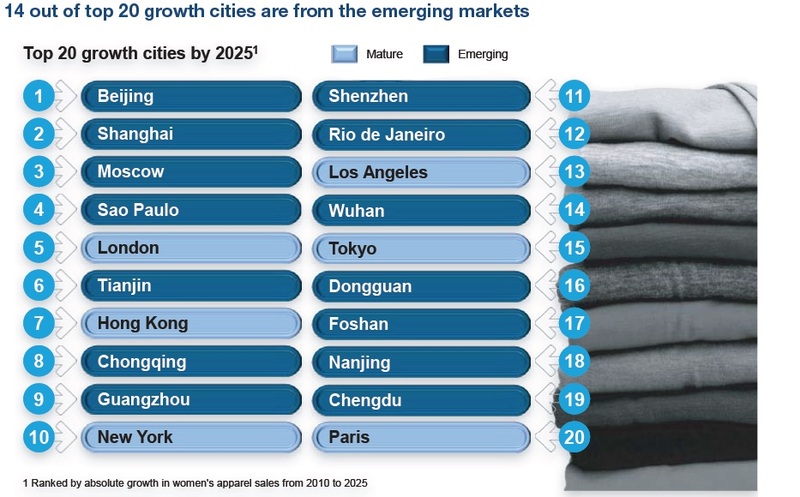 Top 600 growth cities will account for 62% of women’s apparel market’s growth by 2025; and 16 out of top 20 growth cities are from the emerging markets, adding an additional $100 billion to the global women’s apparel market. However, when looking at total size, mature-market cities will still have half the women’s apparel market worldwide, according to McKinsey. Particularly, growth in the luxury markets is still heavily dependent on the mature market, where 70 percent of top growth cities are located. This article explores a lot of topics about the emerging market place for the next decade. In a way this article makes me feel a little better about the job market that is going to be created by the 50% growth rate of women’s apparel by the year 2025. With the market shares increasing it will be interesting to see how trade agreements progress and which ones stay strong. With the top emerging markets being in Asia, the Asia-Pacific trade agreement could play a huge role for the American market. If America plays a smart role and adapts to the changing industry, I think the US could benefit greatly from the expanding global market. There will be more jobs in relation to other countries not only in Asia but another English speaking country for example, London is on the list as #5 for mid-markets. New York is also on the list for projected tops luxury markets, will these only be American designers? Chances are that by 2025 there will be handful of Chinese and Japanese designers that will be heavily involved in the New York fashion world. There are lots of changes that are happening within the apparel industry and if we all adapt to the changes then we will all benefit from the new world. I found this article a very interesting read. This article was about a recent study conducted by McKinsey exploring the global women’s apparel market growth and what this growth means for the market. The growth rate is forecasted to increase by 50% over the next 12 years. This can be explained by the increase in the emerging markets, such as China and Russia. The article also talks about where companies should be establishing a strong presence based on growth rates. I believe that this is important for the industry to be aware of and especially for TMD students who will soon be a part of the industry, to understand where to source from, etc based on the market growth. I agree with the previous comment that the Asia-Pacific trade agreement could be very beneficial for the US. I believe the US and other countries as well can benefit from the global market expansion. The women’s apparel market growth offers a unique opportunity for emerging countries to get involved in the market as well as established countries to adapt to these changes and embrace them. As a TMD student, it is important for me to understand what will ultimately be best for companies, especially the future company I will work for. Understanding the global markets is critical to this. I thought this post was interesting however, not at all surprising. We are constantly hearing about the growing middle class in countries like China. People that are considered middle class have more disposable income to spend on items like apparel. Countries like China, Russia, and Brazil have huge populations and huge potential to be a part of the market with the most growth in women’s apparel. This locations are important as 16 of the top 20 growth cities are located in emerging markets and are expected to add $100 billion to the global women’s apparel industry. This article ties right into our class as we discussed the growth of the global marketplace. As the article stated, emerging markets such as China and Russia have influenced a growth in the global women’s apparel market. In the next 12 years it is predicted that the market will increase by 50%. These numbers show the impact that these markets are having on the textile and apparel industry. McKinsey’s research has shown us that the mature market cities still have half the women’s apparel market when looked at worldwide. It was interesting for me to see that the luxury goods market still depends on the mature market. These statistics show how important both markets are for producing all types of goods. It is especially important for us as TMD students to have an understanding about where and how textiles are produced. The article caught my attention because it talks about the emerging market place in the next few years and how women’s apparel growth rate is going to increase by 50% by 2025. It is crazy to think that the emerging market cities such as Beijing, Rio, and Moscow are the cities that are making the most contribution to women’s apparel growth. This article shows how globalization is working. Both mature and emerging cities are contributing to the growth of women’s apparel. This also shows how businesses are expanding overseas and making a increase in profit. Luxury goods are still a part of the mature market, but that doesn’t mean that the countries won’t expand and join the mature market. i found this article very interesting to read. In our class we have discussed how the global marketplace is growing but i thought it was interesting to learn that the global women’s apparel market is to increase by 50 percent over the next 12 years. Countries with huge populations have an advantage to be a part of the market with the most growth. But what i mainly took away from this article is that this industry has so much potential growth and job wise. First off, I really enjoyed this article. It was very simple yet detailed enough to get the points across. It was a bit promising, showing some hope for the creation of more jobs in the future. I think it is very interesting that the top 16 out of 20 growth cities are emerging markets. This means that companies are becoming more conscious of location before other product categories. This is something very positive, and directly shows the growth of the global market. The growth of woman’s apparel in cities of emerging markets is a key indicator of globalization. It shows some hope for the future for the global market, and also shows the continual growth in already established markets. After reading this article, it definitely reaffirmed what I thought I already knew about the fashion industry, which to me means I at least know my previous knowledge is correct. What does make me interested in this article is that many people do not think about location as being a key factor in where people place their markets, some just might think it is for convenience. This ties back to globalization because if they said the most of the top ten cities if not all are related to the US, then we would not really be using globalization in the sense that we would be experiences trade and other cultures at all. We wouldn’t get the help and resources we need based off of globalization if the major cities weren’t spread around the world. This article is also showing how the already and potential developed countries are having good or high economy and will continue to grow with the years to come. However if they are saying that because, in the future years, that people will be conscious about where they place their markets, will more than just New York be considered a top ten key city or will others emerge that we might not realize? Or will the US even been considered in the top 10 in 2025? I found this article very interesting because it showed me how globalization is affecting the global textile and apparel sector. Although it was not surprising to me to find that the women’s apparel market is constantly growing, it was surprising to find that the cities that are contributing most to this growth are cities such as Beijing, Shanghai, and Moscow. This, as well as the fact that 14 out of the 20 growth cities are from emerging markets proves how much globalization has made an impact on the world we live in. Emerging markets are the primary driving force in the growth in the women’s apparel market, which shows me how smaller markets can make as big of an impact on the global textile and apparel sector as developed economies can. Previous Previous post: Exclusive Interview with William L. “Bill” Jasper, Chairman & Chief Executive Officer, Unifi Inc.
Next Next post: What does Vietnam’s Textile Factory Actually Look Like?